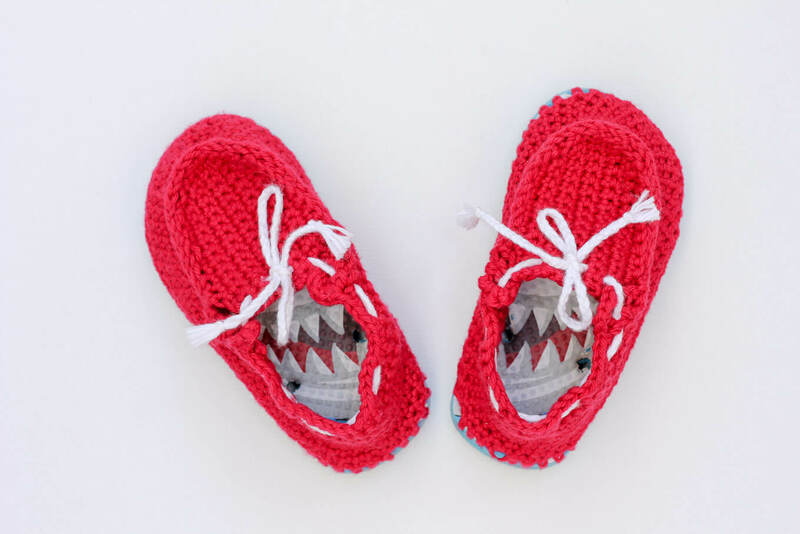 These crochet toddler slippers are made to resemble boat shoes and have a flip flop sole for extra busy-toddler grip. The pattern I posted a few weeks ago for women’s summer slippers made from flip flops has been quite popular. I’m so glad, because my toes are definitely big fans of my own pair. It probably goes without saying that as soon as I was shuffling around the house in some fancy crochet kicks, Momo requested her own pair. I let her choose whatever flip flops she wanted and she opted for a vivid shark pair from Walmart. And well, sharks mean beaches. Beaches mean boats. Boats mean boat shoes. 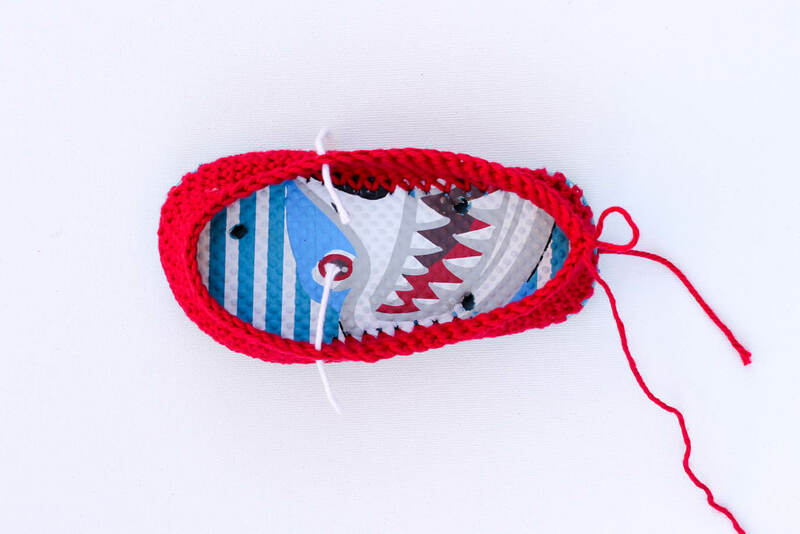 And thus this crochet boat shoes pattern was born. • You might want to size down when buying your flip flops. 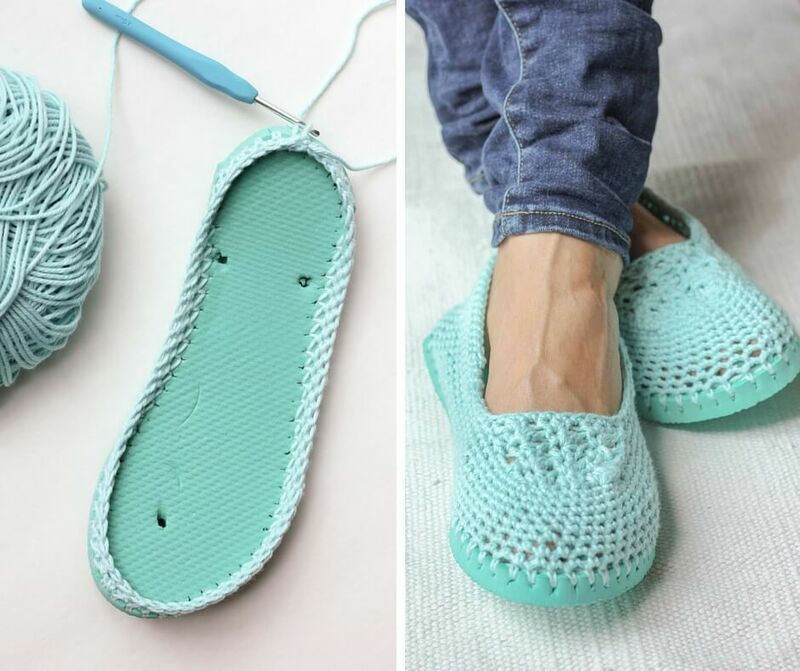 Since your foot won’t be held in by the flip flop strap, your normal size of flip flops might feel a bit roomy as crocheted slippers. • I used a sharp tool meant for clay to poke my holes. A skewer, small drill bit or something similar could work too. • The reason the pattern calls for a smaller hook for the first row is simply because it’s hard to fit the larger hook into the sole without stretching the holes out too much. You may make items to sell with this pattern. In exchange, I ask that you link back to me into two places — one link to my homepage (MakeAndDoCrew.com) and one link to this post page. Do not use my photos as your own sales photos. Do not distribute this pattern as your own. All clear? Alright, let’s make something awesome! PURCHASE A PRINTABLE PDF OF THIS PATTERN FOR $2.50 BY CLICKING HERE. Perfect for crocheting on the go or mobile viewing! 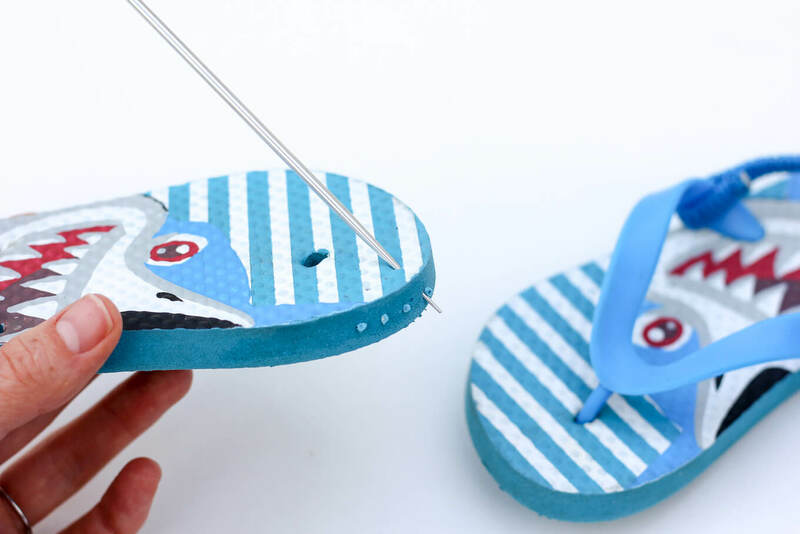 Using your sharp instrument, poke holes about every 1/4 inch around each flip flop sole. You want the hole to go at an angle from 1/4″ from the edge of the top of the sole and come out about half way down the side of the sole. 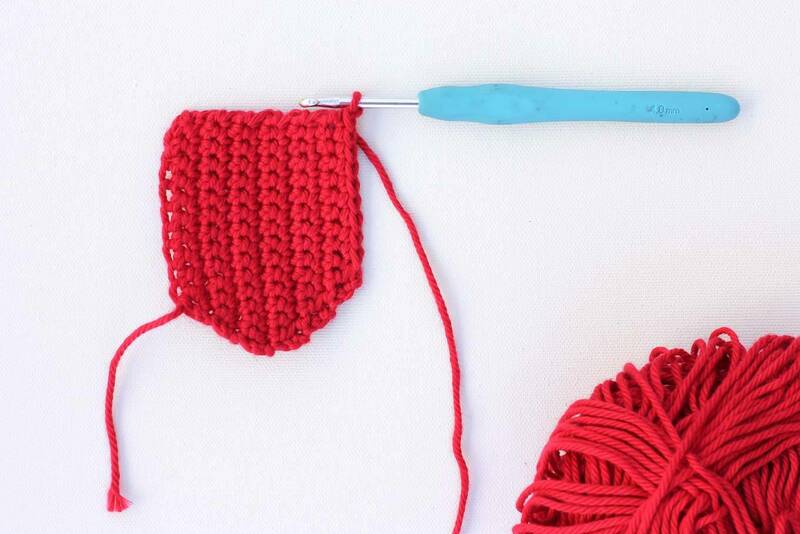 Make your holes far enough from the edge that the yarn won’t rip through the rubber when you create your first row of crochet. 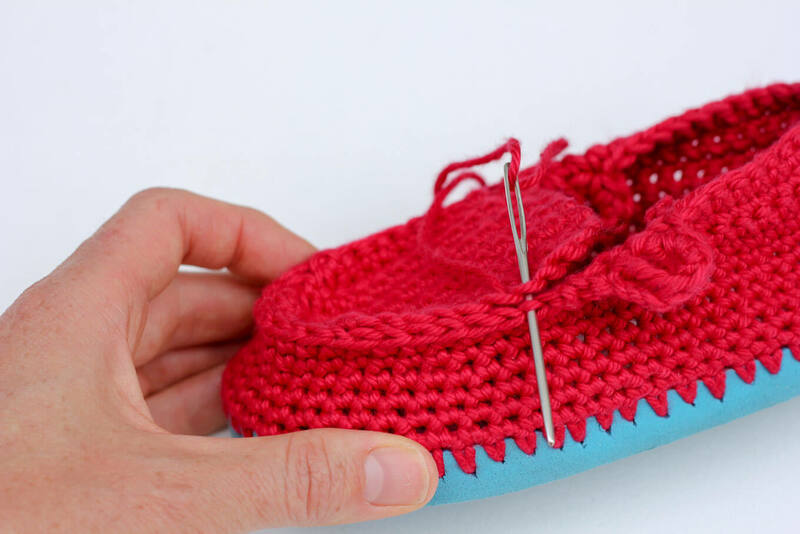 Using smaller hook, attach yarn at the back of the heel by inserting your hook from the top of the flip flop toward the bottom of the sole, grabbing the yarn and pulling through to the top. Ch 1 through the loop you’ve created to attach the yarn to the flip flop. Row 1: Using smaller hook, sc into each hole around sole. Place one stitch marker on either side of the slipper, two thirds of the way down the sole toward the toe. This is where the hole for the laces will end. Do not turn work, continue with Row 9 in the same direction as previous row. Row 9 (see photo above): 1 sc in each sc until 1 sc before marker. sl st in sc before marker; turn. Row 10: ch 1, 1 sc-dec into next 2 stitches, 1 sc in each sc until 2nd to last stitch, sl st in last sc; turn. Row 11: ch 1, 1 sc-dec into next 2 stitches, 1 sc in each sc until 2nd to last stitch, 1 sc-dec in last two stitches; turn. Row 12 (to form lace hole – see photo below): ch 3, tr in next 2 stitches, 2 sc down side of tr, 1 sc in next sc, cont 1 sc in each sc until 2nd to last stitch on other side, 1 sc-dec in last two stitches; turn. Row 13 (to form lace hole): ch 3, tr in next 2 stitches, 2 sc down side of tr, 1 sc in next sc, cont 1 sc in each sc to mid heel where you fastened on, sl st in next sc. Fasten off and weave in end. Tip: The increases and decreases always take place at the same end where the tail from the initial chain is hanging off. Align tongue with curved edge toward toe. Beginning ¼ “ from the top edge of the tongue, sew the inner edges of the tongue and slipper together with a mattress stitch. (Here’s a good mattress stitch tutorial.) Make sure to only go through the inner loops as pictured so as to avoid a bulky seam. Stop with ¼” of tongue left unsewn, fasten off. Weave the braided laces through the slippers as pictured. 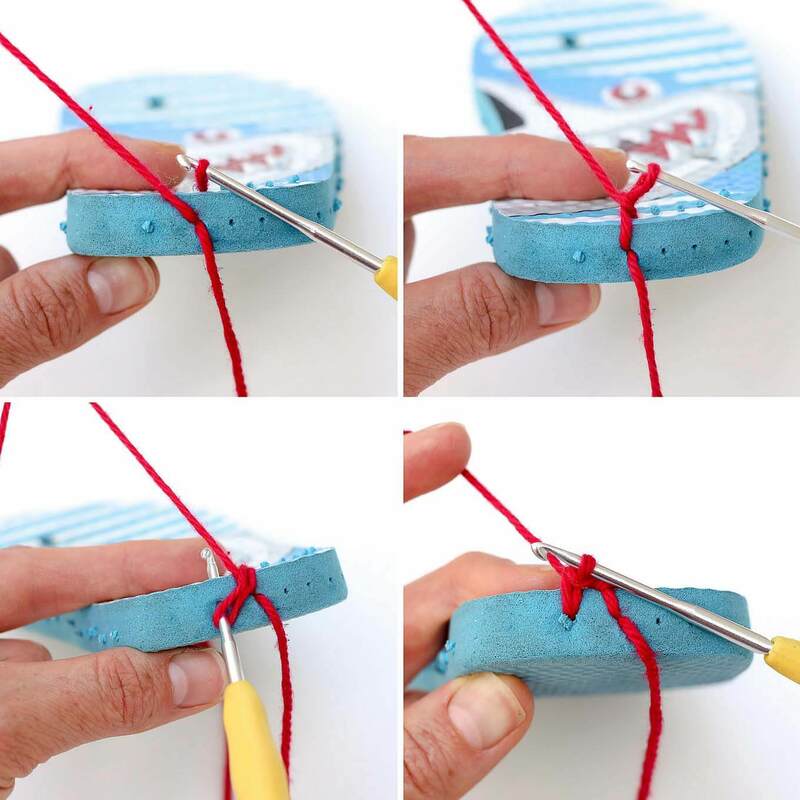 In order to allow the laces to anchor the laces loops on the sides of the slippers, make sure your laces are entering the holes in the same direction as in the photo. Strap these magic slippers on your favorite kiddo and watch them run around the house with glee. Now you want a pair for yourself, don’t you?! 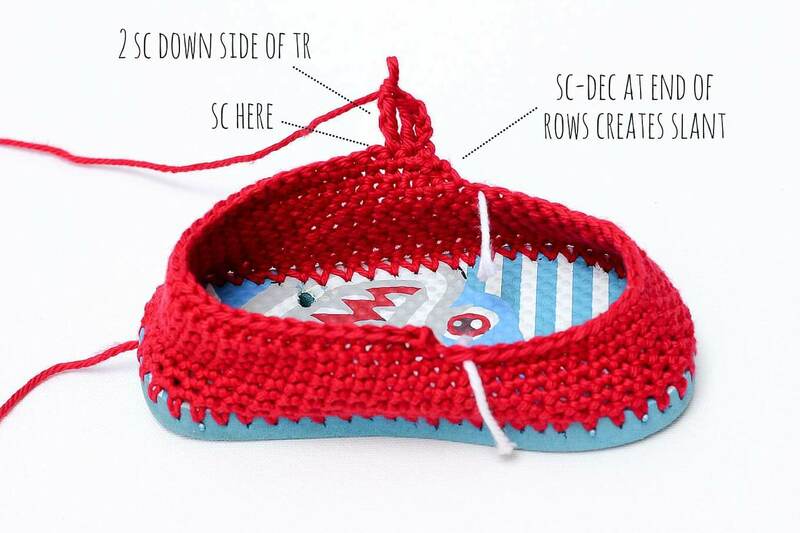 Check out my free women’s crochet summer slipper pattern to make your own! 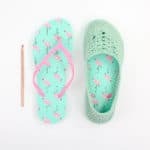 Free Lightweight Crochet Slippers Pattern–With Flip Flop Soles! It looks like there are some good deals on Amazon. (That’s an affiliate link.) Or I’m sure Michaels.com or Joanns.com would have one too. Anybody besides me end up with really tall shoes? I had to redo these only doing half the rows! I love the pattern and after tweaking it I came up with the same thing you did! This happened with the ladies slippers as well. I even used an F hook instead of a G. I guess I’m a goofy crocheter! 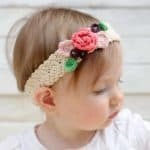 Thanks for the adorable patterns you create and share! How funny. I wonder what happened. Are you used to UK terms by any chance? I was intending these to be US terms, in which case sc would mean single crochet. I can see if you used double crochet they might end up really tall. Either way, I’m glad you found a solution that worked for you! I’m actually having the same issue – just finished the first one and showed to my husband so I’m starting the second one and going to see if I do half if I get what it should be in my mind. 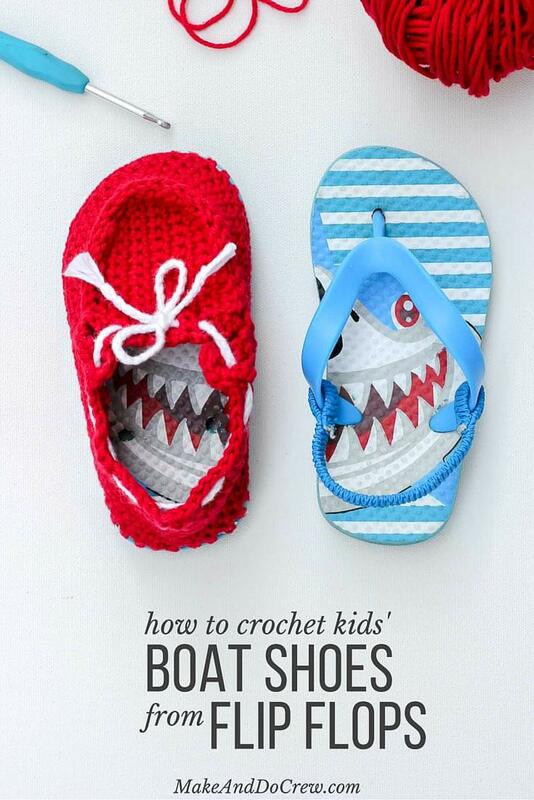 I would love the boat slipper in an adult version. 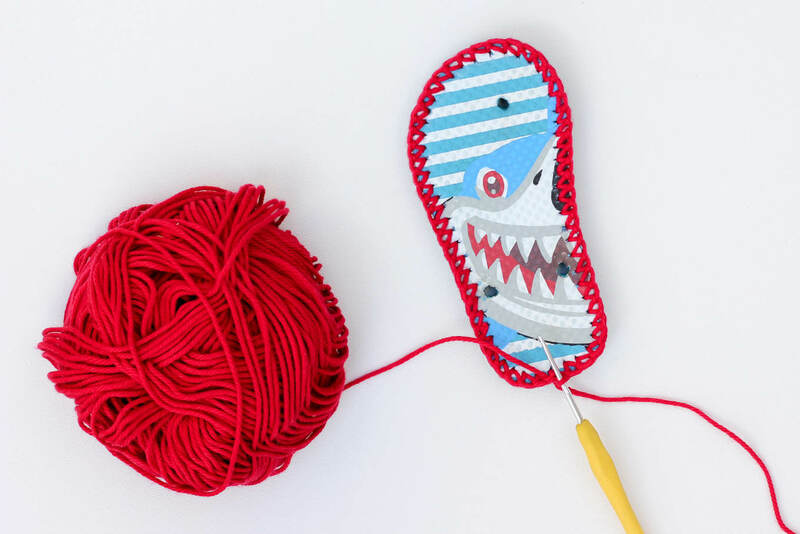 I am an above beginner crocheter but not much so would I just use my own flipflop and follow your directions adding more stitches? I LOVE IT! I would also like to try to make a pair for my 10 yr old grandson. I’m planning to make an adult boat shoe pattern version 🙂 In the mean time though, I do think you could just use adult flip flops and add a couple rows to the total number around the soles and make the top toe piece a bit bigger and you’d essentially have the same thing as the kids, only bigger. Hope that makes a little sense?! these boat slippers are adorable! love that you share the tute and pattern with us! Flip flops and Shoes for kids are absolutely adorable. I wish they would make them in adult version too. Cuteness at its best. I saw these floating around Facebook and loved them. This is my first actual project I’m tackling. I’m stuck at beginning row 9. Im nearing the end of row 8, at the heel. If I were to start row 9 at the heal and then do my turn at the 3/4 marker, wouldn’t The stitching on say the left side, be twice as high once I get back to the heal? Any help will be much appreciated. Thank you for the lovely pattern as well!! Thanks so much for the patterns!! I will be doing both toddlers and adults. Awesome! Hope you enjoy them, Christa. We get a lot of use out of ours around here. I can’t wait to make these! I care for a two year old 4 days a week who runs even when he walks making lots of noise for my downstairs neighbors. I’ve already knitted him a pair of “magic” slippers for running and jumping in the house. I sewed in layers of an old foam mat for padding and used silicone to make them non skid but since he wears them all the time, they get smelly real fast. I think these will be just as effective for dampening the sound of his steps but easier to clean and deodorize without having to put them in the wash. Thanks for sharing this pattern. wow, so adorable pair of shoes and glad to hear that i can make it too for my younger sister.she will really like it.Thank you for such a great post and information. You’re welcome! You have one lucky little sis! I’m late to the party, but I just made these and my son is in LOVE. It’s going to take a lot of convincing to get him into “real” shoes for PE tomorrow :P. Thank you again for such a wonderful pattern! Aw, I love hearing that! They’re really fun for kids, aren’t they? My daughter loves running around the house in hers. Oh great! My kids love these too! I’m so happy to hear you had fun making them. Hi I love the boat shoe and I am working on making an adult size for me, but I would like a clog pattern with a flip flop sole. I have a problem with shoes fitting me because I need slender sizes and I have narrow heels. I do wear flip-flops so I was wondering if yours would work if I used the whole thing instead of taking the toe and sides off of the flops? How many holes would you poke for a 5/6 flip flop? I’m sorry, I’m confused by what you’re saying. 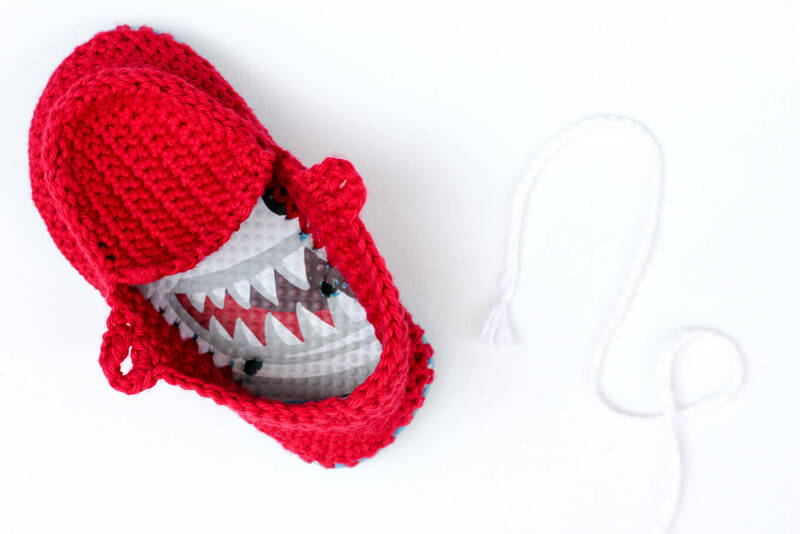 These are indeed slippers I designed and crocheted myself for my daughter. Would you like to clarify further? 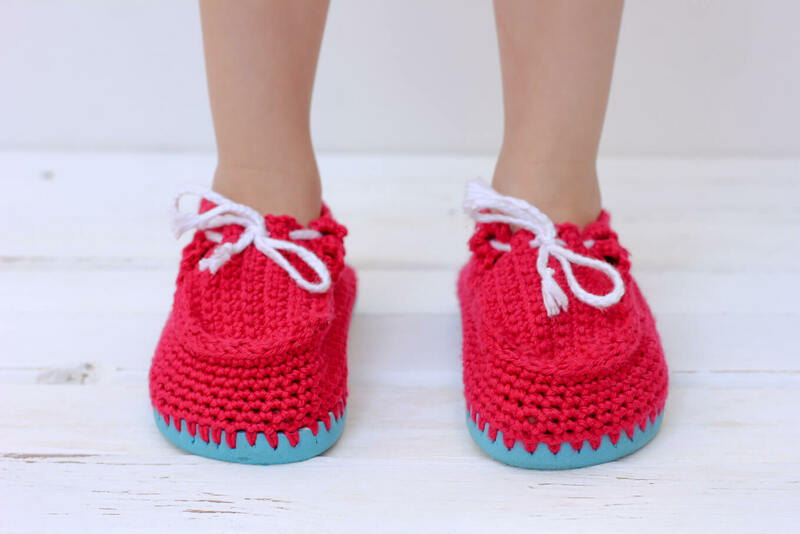 where can I find and download the pattern and instructions for the Adult size moccasins?